On November 30th, the Swiss are voting whether to amend their country’s constitution on an initiative entitled ‘Save our Swiss Gold.’ The Swiss gold initiative appears widely misunderstood, both inside and outside of Switzerland. We discuss implications for gold, the Swiss franc and Switzerland as a whole. The initiators of the gold initiative appeal to Swiss citizens desire not to sell out the ‘family silver.’ In the late 90’s, the Swiss National Bank (SNB) owned 2,590 tons of gold; since then 1,550 tons have been sold at prices far lower than today’s prices. While the Swiss might like their gold, they are fiercely independent. That’s relevant because by imposing a ceiling of the Swiss franc versus the euro, the SNB has de facto imposed the euro on Switzerland, a step closer to joining the euro – something many Swiss object to. More importantly, many Swiss may find it inappropriate for what is supposed to be an apolitical body like the SNB to impose policies with major political ramifications. Not surprisingly, the Swiss government – which opposes the initiative - does not frame the discussion this way, but instead talks about the flexibility the SNB needs to implement its policies. It also points to the ‘losses’ incurred in 2013 when the price of gold fell. •	Gold reserves of the SNB must be ‘significant’ and must not fall below 20%. •	Switzerland has 5 years to phase in the 20% reserve requirement. It should not be surprising that the Swiss government is against any outside restrictions imposed on the SNB, but not because it jeopardizes central bank independence, but because it reduces the flexibility the government has. But that, of course, is precisely the purpose of constitutional initiatives available in Switzerland. •	The gold held by the SNB was purchased at dramatically lower prices. If more gold were sold, no losses, but substantial gains would be recorded. •	What most are not aware of, however, is that the more money a modern central bank ‘prints,’ the more interest bearing securities it buys, the greater the “profit” of the central bank. That’s why central banks brag how ‘profitable’ their policies have been. •	However, while the Fed has only purchased domestic securities (US Treasuries and Mortgage Backed Securities), the Swiss National Bank has been buying Euro and U.S. dollar denominated securities. In doing so, the SNB has truly introduced massive currency risk. •	Except that central banks don’t really care about losses: the Bank of Israel, for example, has had a negative net worth for over 20 years. 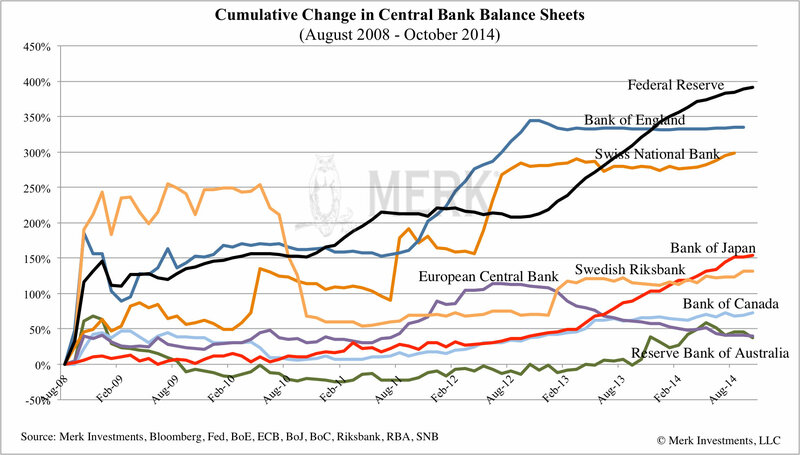 Losses for a central bank make for bad PR, but a central bank can simply ‘print’ money to pay for its obligations. Some central banks, such as the European Central Banks, have in their statues that member states must pay-in additional capital should the ECB suffer losses. Gold sales needed in times of crises? The Swiss government argues a central bank must be able to sell its gold in times of crisis. Let’s think about this: such a ‘crisis’ might occur when a bank is over-leveraged and must be rescued. To facilitate a ‘rescue’, the SNB is likely to provide “liquidity” (money printing with the promise that it’s only for the short-term). If a bank is insolvent rather than illiquid, it might require a capital injection. That capital has to come from somewhere. If gold is sold for this purpose, it is the people’s gold that’s being sold. The government likes to keep an option open to socialize losses. We would argue that the very reason “too big to fail” exists is because governments play rescuers that are all too willing to sacrifice the wealth of the public. They say such measures are for the common good – because depositors might lose their money in a bank. Indeed, when a bank collapses, it is the savers that lose out, as the savers are the folks that have loaned money to the bank. The way to protect savers, though, is through prudent policies that require those that take risks to be responsible for losses. Gold is the people’s money, not the government’s money to splurge. If a currency is backed by gold, then the currency represents the gold. It’s not for the government to give away: that’s why the initiative argues against selling any of the gold, ever. It’s for that reason as well that the gold does not need to be kept abroad: gold is a store of value that ought to back the currency in circulation. 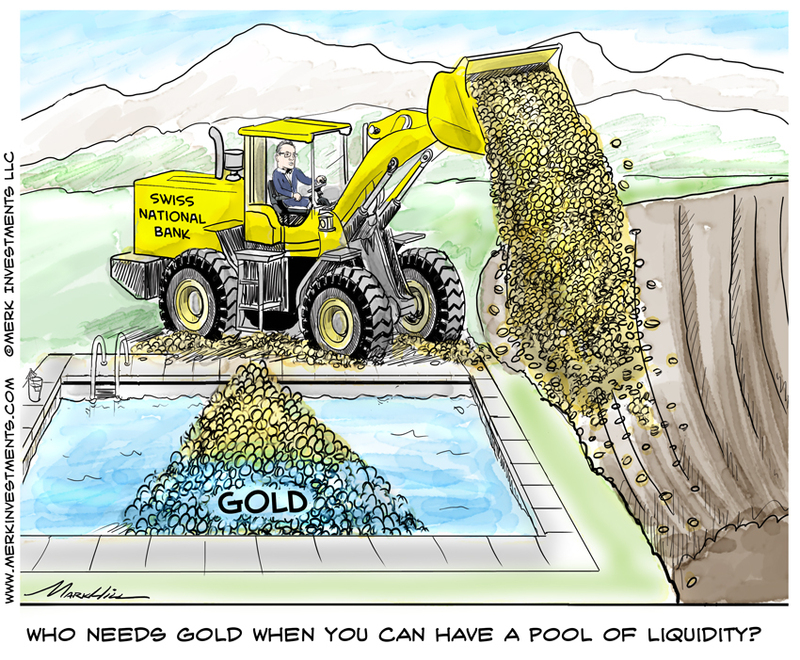 •	Assume that 20% of the SNB’s assets are backed by gold and the price of gold drops. The SNB would be immediately required to purchase more gold. As such, over time, the SNB’s reserves would likely be above 20%. In our assessment, dynamics may well move them to be closer to 100% over time. Basically, whenever there is a crisis and the SNB might be tempted to ‘print money’ to bail out an institution, it would chip away at the SNB’s flexibility for future bailouts, more gold is held that cannot be sold. •	An activist SNB that continues to buy foreign securities may, over time, have a hard time defending a ceiling on its currency. That’s because a ceiling on its currency is akin to a bailout to the country (Switzerland) as a whole, arguing that debasing the currency is good for the country. The Swiss government argues that the strong Swiss franc is a concern to exporters. No kidding. Other concerns are competitors – maybe we should get rid of those, too. And those pesky customers that don’t always feel like buying gadgets and services that are Swiss made. Kidding aside, we would argue that it is impossible for an advanced economy to compete on price. An advanced economy has to compete on value. Very few low-end consumer goods are exported from advanced economies. Look at beer, as the one area where low advanced economies have tried to compete with what might be considered as a low-end product: first, beer is branded as a premium product these days. In order to have pricing power there has been massive consolidation in the brewing sector over recent decades in much of Europe; Switzerland has been left behind in this trend – but note that these are trends that have been firmly in place well before the financial crisis. A weaker Swiss franc wouldn’t fix these challenges. The alternative to scale is to then try to be profitable at the local level; indeed, microbreweries with no export market have succeeded in many high cost areas. Swiss multi-nationals have long learned to have natural hedges in place, matching revenue and expenses in their export markets. Switzerland has always had a tough market. It is said that because of how critical Swiss consumers are, that if someone can have a product succeed in Switzerland, it can succeed anywhere. We live in a world drowning in debt. The U.S., European Union, Japan, to name a few, cannot afford to pay all the promises they have made. As Alan Greenspan recently said, a welfare state cannot support a gold standard. These other countries will debase their currencies over time in an effort to make their liabilities more affordable. It won’t be easy to sell to countries that have put policies in place that we believe may impoverish their middle class. The solution, however, is not to impoverish Switzerland. It won’t be easy, but the sooner Switzerland embraces the reality that competitive devaluation is not in its interest, the better.